The “America’s Got Talent” judges have seen all of the acts, and it’s now time to re-evaluate the ones who have been moved through to this round called “Judgement Week.” During this time, judges Howie Mandel, Howard Stern, Heidi Klum and Mel B will determine who they think will be good enough to perform during the live shows at Radio City Music Hall. The kids acts were the first to re-audition for the judges for their spot at Radio City Music Hall. 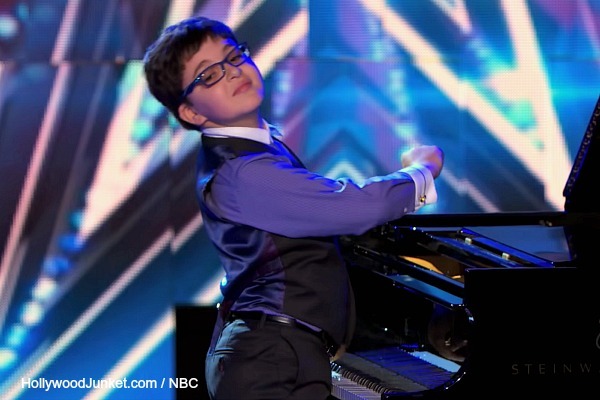 Child prodigy piano-playing Adrian Romoff was up first. Adrian who is so smart he is five grades ahead in school, said going to Radio City Music Hall is one of his dreams. During his first audition when Heidi asked him if he is really that smart, he answered “according to reality, yes!” After Adrian’s second audition, Howie said “just a kid prodigy playing piano at Radio City Music Hall, is it enough?” Howard said he loves Adrian. Byamba’s Contortion Girls are four girls ages seven to eleven. The girls contorted themselves together again for their second audition. Howard said it was amazing what they do, “But they did have issues”. “It was flat” said Mel B.
Kaycee and Gabe are eleven and thirteen years old. They danced around and did fake “selfies” to a song by the same name. Howie thought Gabe was better than Kaycee. Howard said he hoped that the kid acts would take it up a notch. But it went down-hill. Kieran and Finian Makepeace are two young men on guitars, drums and vocals. They chose to sing a cover song for their first audition. This second time around, they decided to perform an original song . Howard said it was “risky.” Howie asked them if they think that the song stood out more than the competition. Heidi said it’s amazing what they do with two people. Mel B also liked them. Howie said “we have a big debate.” Howard agreed. Jonah Smith sells insurance for a living. His dream is to be making a living singing with his band. He said when he got married, that’s when he got a day job. He played an original song at his first audition with a full band and the judges called him “fantastic”. This time around, his drummer decided not to show-up. The production delayed their second audition. Jonas got a drummer at the last minute. The end result? Howard said he came off “50 billion times better” than his first audition. Next, Mudslinger was up again in “Top Hogs” act. Heidi said she wasn’t going to kiss the pig again. “Once was enough!” Mudslinger did some basic math. Howard said “This act actually went downhill”. Flight Crew Jump Rope said their act is very “precise” and if one thing goes wrong, it throws everything off. Howard said he enjoyed it “I saw moves that we have never seen on America’s Got Talent”. Voting closes on July 29th for the last of the 48 acts to be picked out of the three finalists that were chosen on the TODAY show. Frank Dimitri is a seventy-four year old retired bartender chasing his dream of singing, overcoming his stuttering. He impressed the judges during his fist audition while singing a Frank Sinatra tune. He said it’s a big thrill in his life being on AGT. He returned and sang Frank Sinatra song “I’ve Got You Under My Skin.” Heidi said “he has a wonderful quality to his voice.” Howard said if you close your eyes, he sounds younger. Justin Rhodes is twenty-three and his parents didn’t want music to be his career. His dad watched him perform for the first time during his first AGT audition. His dad kept in contact with him since that show to form a stronger bond. The judges were not impressed this time around. Howie said maybe they should take their first audition into consideration. Miguel Dakota is the oldest child in his family and dropped-out of college to work in construction to help support his family. He sang another song similar to the one during his first audition. Miguel proved once again that he has that “it factor”. Mel B said his voice is “powerful.” Howie said he thinks Miguel has something that he didn’t show them. Paul Ieti is a soldier in the Army. Even though he was “terrified” during his first audition, he was so good, he go a standing ovation from the judges. Paul sat down and sang a little tune during his second audition. The judges all agreed that he was very good. Heidi said “it is so easy for him to sing.” The judges all agreed on their decision for Paul, so they called him back out to the stage to tell him he was going to the live shows at Radio City Music Hall. Bad Boys of Ballet is a group of young men lead by one girl, Adrian who “cracks the whip” on them. Howie said he liked them. Howard didn’t. Salsa dance group called Baila Conmigo is a large dance group made up of dancers ages five to thirty-one. One of the young dancers was dropped during their second audition. It was less than perfect contrary to their first audition. After some time, the judges called them back out to tell them they are being sent through to the live shows. XPogo Stunt Team are four guys ages 17-21 who do extreme stunts on pogo-sticks. They attempted to take their act to a more dangerous level by using fire. Soon after adding fire to the pogo stick, the flame went out. Heidi said she still likes them. GOING TO RADIO CITY MUSIC HALL: Out of the many acts that the judges had to make excruciating decisions this seasons on putting through to the live shows, some of the ones that made it were singers Miguel Dakota, Anna Clendening, comedian Darik Santos, stuntmen Loop Rawlins, JD Anderson, dance acts Sean & Luke, Bad Boys of Ballet. MORE! Performing Live next week: Miguel Dakota, Flight Crew Jump Rope, Julia Goodwin, Jasmine Flowers, Emily West, Dan Naturman, The Willis Clan, Sean & Luke, Baila Conmigo, JD Anderson, Valo & Bobby, David & Leeman.